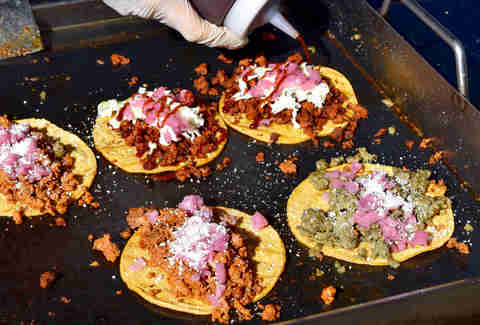 If you live in LA, chances are you’ve devoured plenty of chorizo-stuffed breakfast burritos and tacos -- but, until you’ve tasted the handmade, artisanal links of fourth-generation chorizo maker Humberto Raygoza (aka “The Chori-Man”), you haven’t really enjoyed the full Mexican chorizo experience. What began as an after-hours project at home for Raygoza has since become a thriving business that continues to grow across LA. When he’s not elbow-deep in the hours-long process of making his chorizo, you can find Raygoza at his recently opened brick-and-mortar location in San Pedro -- and before that, you may have spotted him hustling his chorizo in burrito and taco form at farmers markets and breweries, including Brouwerij West and Boomtown Brewery. But it wasn’t always so easy to track down Raygoza’s artisanal chorizo. Before that, Raygoza attended UCLA for nursing, but as he tells us, “I got tired of being a broke student.” His parents had arrived in the US in the late 1970s from Zacatecas and made chorizo to make ends meet, with his father often walking the streets of Van Nuys to sell it. “I remember being a kid helping to clean chiles, make the adobo, and the seasoning,” Raygoza recalls. So, after a trip to visit his relatives in Calera, Zacatecas, he decided to call his dad to get the family chorizo recipe. "I gutted my apartment and literally sold everything I owned, and whatever didn't sell, I just donated." Despite his father’s efforts to dissuade him from the grueling grind, Raygoza persisted, and his father eventually shared the family secrets with him. Using the recipe and tips from his father, he set to work refining his own rendition of the family’s signature, Zacatecas-style chorizo, which derives its bright red color and much of its deep, complex flavor from guajillo chili peppers. “The first thing you have to have for a traditional chorizo is a good adobo,” Raygoza tells us as he walks us through the process, beginning with the spicy, vinegar-based marinade that’s foundational to chorizo (as well as other Mexican dishes). Raygoza also grinds his own meat, which for his Zacatecas-style chorizo means pork shoulder with around 70% meat to 30% fat. “If you have store-bought chorizo, it's usually really fatty with a lot of filler such as glands and stuff like that, and it’s overly spiced with a bunch of white vinegar, it's really tangy,” he explains. Raygoza then mixes the ground meat with the adobo by hand and allows the flavors to marinate and deepen, before adding the blended mixture to a sausage stuffer to fill long stretches of natural hog casings, spinning the sausage into a spiral as he fills them. 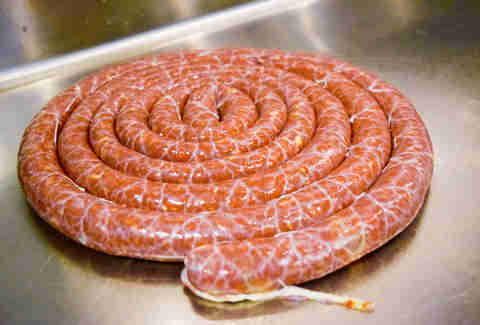 He then ties the sausage into links -- by hand. “I hand tie everything, whether it's 100 pounds, 200 pounds, or 300 pounds,” he boasts. “The little links are the style of the area where I'm from, and that's how we do it.” He then gives the links an overnight hang of at least eight hours, to allow excess water, vinegar, and salt to drain out. Raygoza was then able to expand his operation and provide customized chorizo to restaurants around LA he soon began supplying several restaurants, including Salazar, The Federal Bar, and Sonoratown. He suddenly went from producing 50 pounds of chorizo a week to around 200 pounds -- and now that he’s producing at his own shop, the number is in the thousands. “My grandfather learned to make chorizo from my great-grandfather who was from Spain, and started making it when he arrived in Calera, Zacatecas,” Raygoza explains. His great-grandfather passed away not long after he and his wife immigrated to Mexico, and didn't have a chance to open a shop there, but would still make chorizos and hams and sell them from the window of their home. “My grandpa was the first one to have a carniceria in that little town, and then his brother opened one, and the Raygozas were the butchers of that town,” says Raygoza. The family business rapidly expanded from there. His father had 12 brothers and sisters, along with 12 cousins from his great-uncle’s side. “Half went into the butcher shop business -- starting with little shops and now large packing facilities -- and on the other side, those that didn't, are in agriculture growing peppers or catering,” Raygoza explains. 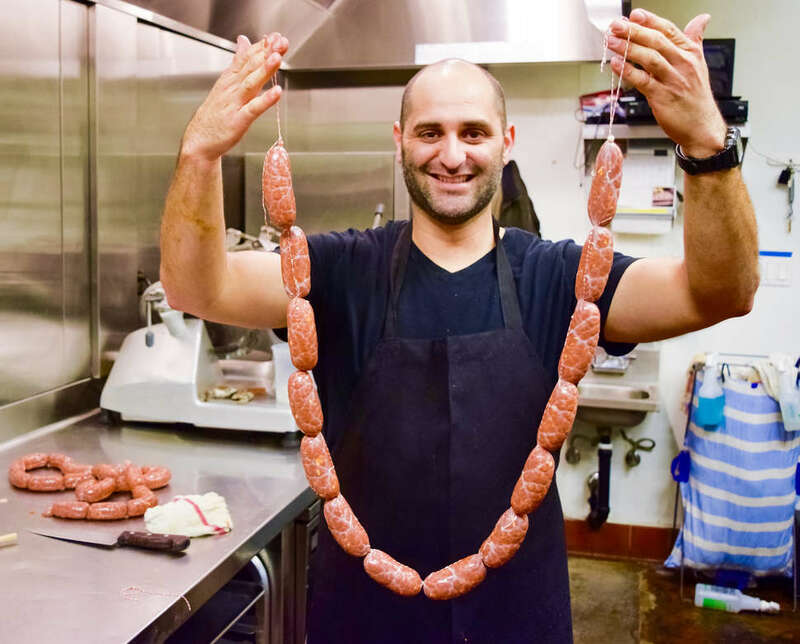 Now that Raygoza has begun experimenting with Spanish-style chorizos as well, he appreciates that the family traditions have come full circle and sees his own journey as part of a long lineage. “It feels awesome, because I never thought I would be in the family business,” he says, but that’s an understatement of sorts. Rather than just being in the business, Raygoza’s taken his family’s traditions and reinvented them in his own image: LA’s one and only Chori-Man. Danny Jensen is a regular Thrillist contributor who now has a much deeper appreciation for quality chorizo. Follow him to the next great taco stand on Instagram and Twitter.